Unexpected and unaffordable expenditures are the main reasons behind buying insurance. You may be buying all types of insurances, for your family, your car, home and yourself, just to be prepared for the sudden expenditures. But, have you considered buying health insurance for your pet? Taking care of pets has not been taken seriously as far as its cost is concerned. Pet health insurance is just as important as your own insurance to avoid big expenditures. It may not be feasible for a $160 urinary tract infection, but for $3550 fracture repair, it definitely is. Heartworm treatments, intestinal worm treatment, fracture repairs, etc. can be unaffordable for anybody. To have a balanced and composed home economy, health insurance for pets is highly recommended. You do not have to just buy any insurance; you need to buy an appropriate insurance. 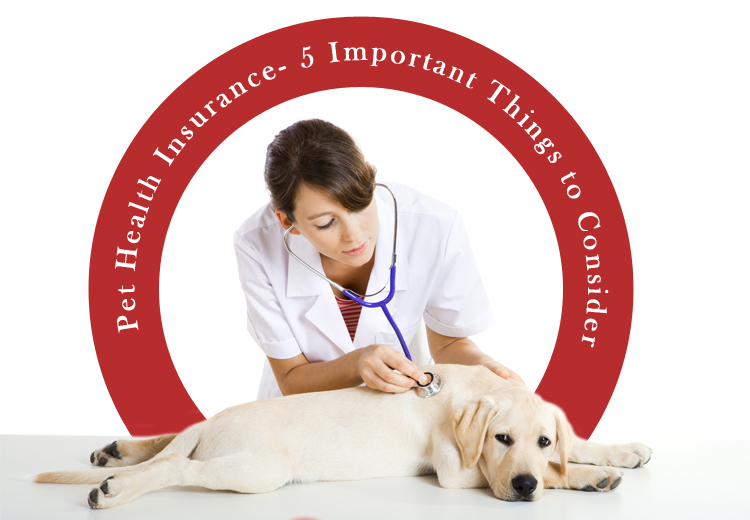 Choose a pet health insurance policy wisely after considering some important aspects. Here are 5 things to consider that will help you to choose a better insurance plan! 1. How much experience does the provider have? Well, the older, the better! The insurance providers can provide you a number of options in policies if they are in the business for a longer time. The older firms can be trusted as you can get their authentic reviews easily. Check their experience and avoid getting into newer firms. 2. Does the policy have life-time coverage? For chronic issues like diabetes or cancer, it is important to verify with the provider whether the policy will continue to secure such problems even after the renewal of the policy. It may happen that they consider it as pre-existing conditions when the time for renewal of the policy comes. If any pet health insurance provider gives lifetime coverage for such problems, then it can be considered the best. Try searching for such insurance companies and shake hands with them. 3. Are there any limitations on choosing a veterinarian? There are many companies that imply limitations on the aspect of veterinarians. Pick a company which allows you to visit emergency clinics (even after hours), any veterinarian in the country and specialists like ophthalmologist, oncologist etc. 4. What does the plan cover? Illnesses: Curable as well as chronic diseases like diabetes and cancer should be covered. Hereditary and congenital conditions: Conditions like hip and elbow dysplasia, glaucoma, epilepsy, IVDD, luxating patella and cherry eye are some examples of such conditions. Prefer those plans which include these conditions. Accidents: Any accidental damage like broken legs or cuts should be covered in the plan. Moreover, choose a plan that would also allow surgery costs for removal of swallowed objects. Wellness rewards reimbursement: Look for a plan that includes the coverage of routine care or wellness conditions like vaccination, flea and tick treatments, dental cleanings, blood tests etc. Wellness rewards may cost you extra but they are worth adding to your plan. 5. More importantly, what is the overall cost of the policy? With all the minute details to consider, don’t overlook the overall cost of the policy. Compare policies from different providers and choose the cheapest, but the best one that has cheaper premiums. The conclusion is that, your furry friends need a thorough care which may cost you a fortune. To balance your economic status and your four legged friend’s health, pet health insurance can contribute well. Don’t you want to pull your pet out of any lethal situations without thinking about its cost? Well, this is your chance to secure your pet’s future. Choose your pet insurance plan intelligently and make the best of it! « Dogs- The Best Way To Improve Your Health!